The anti-Palin Tweet brigades has rush to get their thumbs into action tweeting like Berzerkers over a new Gallup Poll which shows Palin “at the lowest favorables too date. If they would calm down in their PDS and look at the facts they would see in the Huffington Post Pollster site a different story. The Gallup tracking poll has Palin at 40% Favorable to 52% Unfavorable.The Pollster aggregate poll of polls has her at 38.5/50.9 so Gallup actually shows an improvement in her favorables ! Not only that the most recent Fox poll (see Pollster chart)-which some might expect to be biased towards Palin actually has her at 35/53. And in contrast to Gallup the latest (no friend of Palin) Associated Press poll has her at 46/49. As I showed recently, the trend for Palin in the aggregate is unmistakably upwards.One poll,whether positive or negative should be ignored-which of course the PDS haters find impossible. The point is that Rick Moran’s “Right Wing Nut House” which was a go to site for conservatives, is clearly running out of steam. It was a focal point for conservative activists and postings were the subject of lively debate. Contrast that with the current site where the last seven postings have elicited not a single response. That could mean that all Moran’s dwindling number of readers are totally in sync with every word that he writes or that no one is interested in anything he has to say any more-certainly not the activists. The fact that Moran has taken an anti-Palin stance may have something to do with his admitted decline. The fact of his pugnacious response to anyone who dare criticise his postings may also have something to do with it. et al brigade and the Tea Party/Palinist activists. I am proud to add my small voice to the latter and, am gratified to note, that since I have been taking a more vocal, Palin dedicated stance the readership of this blog has increased by 2.5 million places on the Alexa blog popularity measuring site. It is clear, I believe, whose side the vox populi stands in this battle for, and lets be real about it, the 2012 nomination. There are two ways of dealing with the opposition to a cause, to combat them head on, which is the right way of dealing with the Lame Stream Media, and the other is to ignore them altogether which is the right way to deal with the detumescent old guard conservatives. Clearly the voice of the people, which is always right in the long run, has looked at Moran’s site, which has as a recent post “Why The GOP Will Probably Fail” and decided-why bother? The book tour, according to publisher HarperCollins, is a 16-stop campaign starting November 23rd and lasting until December 3rd. As with “Going Rogue,” Palin is not scheduled to make appearances in New York, Los Angeles, Seattle, San Francisco or other cities where Democrats are more favorable which will certainly raise 2012 speculation as she’s scheduled to visit significant political states like Iowa. The book which will be released Nov. 23 and will have a first printing of 1 million copies, is her first since “Going Rogue,” which sold over 2.6 million copies in 2009. 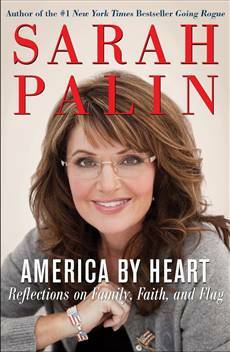 In this inspirational follow-up, the book ranges widely over American history, culture, and current affairs, and reflects on the key values—both national and spiritual-that have been such a profound part of Governor Palin’s life and continue to inform her vision of America’s future. Last night, the DWTS semi-finalists appeared on Larry King Live (h/tp @vaserlan). Each contestant responded to several questions. When asked why she decided to be on the show, Bristol said, “”I know people are going to talk about me no matter what.” Asked how she responds when the judges rap her, Bristol said, “I have really tough skin.” She said she uses their critiques for her next week’s performance. Bristol said that she is competing against herself, trying to improve each week. The Larry King Live website on CNN has a poll, “Who do you want to win DWTS?” Please go there and vote for Bristol and Mark!